Ayyam-i-Ha and Naw Ruz Are Coming! Our new website is up and working with only a few glitches. So now we turn our focus to the upcoming holidays. We’ve been working on some new gift ideas for Ayyam-i-Ha. In the next few weeks we will be announcing several new products, including a new gift pendant, a coloring book, new prayer beads and possibly a new card game. In the mean time, we have several different kinds of holiday cards, holiday ribbon, flags and cake stencils to help you get prepared. If you are already in the mood to start buying gifts, click here for some ideas to get you started. Speaking of Holidays, IT IS A BICENTENARY YEAR! 2018 saw the Baha’i Community go all-out to celebrate the Bicentenary of the Birth of Baha’u’llah. This year we celebrate the Birth of the Bab. To help you do that, we are bringing out new versions of some of the products that were so helpful before. 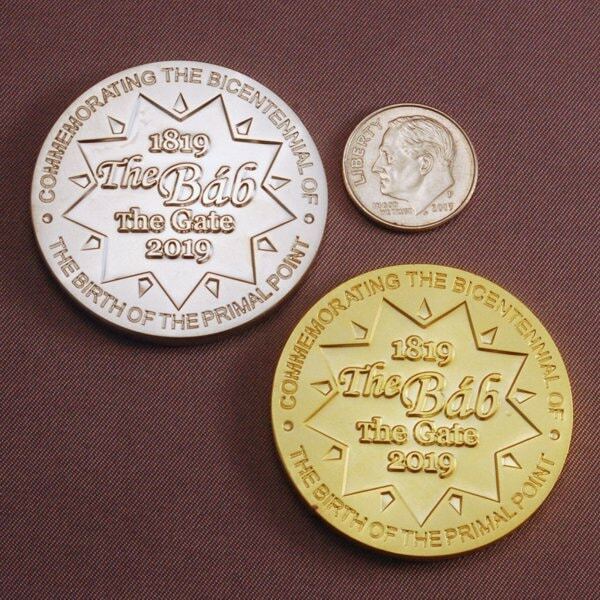 These commemorative medallions, for example, use the same design as last time, but are in a beautiful satin silver finish instead of satin gold. You can wait and give them out at the celebration, or you can give them as Ayyam-i-Ha gifts to get people in the mood to celebrate. We also still have our lapel pins, flags, buttons and activities booklets in stock. 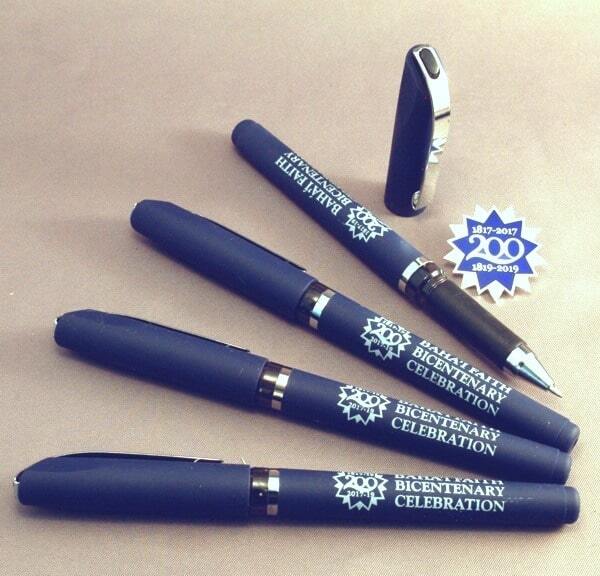 Bicentenary Pens Start Conversations All Year Long! Last year, the pens were maroon. They didn’t have any green pens, so we went with a beautiful dark blue in a suede-finish. The gel ink is a matching fine-point blue.